Although it’s wintertime, many Californians have the luxury of riding bicycles at any time of the year. 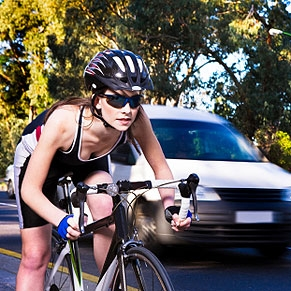 However, bicycle accidents can be deadly, especially when they’re caused by distracted or aggressive driving. A recent article in the Santa Cruz Sentinel reported that a bicycle advocacy group, People Power, is hoping to create “bikeways near highway interchanges” in order to make those intersections safer for cyclists. While these changes would only affect the Santa Cruz area in the most immediate terms, it’s very likely that bicycle advocacy groups across the state could push for additional measures to make bicycling a safer activity in the San Diego area. Many freeway intersections in California don’t even have cameras, so it’s impossible to know how many times a bicyclist has been cut off or almost involved in an accident with a speeding driver. According to one cyclist in the Santa Cruz area, riders often feel as though they’re risking their safety when they ride through a freeway interchange. “There are a lot of avoided and unreported accidents,” the rider explained. What are some of the risk factors linked to cycling? For one, adolescents aged 15-24 and adults aged 45 and older are at greatest risk of a fatal bicycle accident. Children between the ages of 5 and 14 years old and adolescents between the ages of 15-24 are at greatest risk of injuries in a serious cycling-related accident. And if you’re wondering whether your child’s gender can play a role in his or her risk of a bike accident, males are at much greater risk than females of sustaining serious or fatal injuries in a bicycle crash. Wear a helmet, even if it’s not required by law. Wear fluorescent clothing, even if you’re riding during daylight hours. It will make you more visible on the road, and if it gets dark while you’re riding, other drivers are more likely to see you. Install active lighting on your bicycle, including front white lights and rear red lights. You want to do everything in your power to increase your visibility to other motorists. If you or a loved one has been injured in a serious bicycle accident or pedestrian accident, don’t hesitate to contact an experienced San Diego personal injury lawyer to discuss your case.